Stefanos Tsitsipas will be among the seeds at a grand slam for the first time when the US Open begins on Monday. The 20-year-old Greek has enjoyed a stunning rise to prominence in 2018, reaching the finals of the Barcelona Open and Rogers Cup to underline his rich potential. We examine the background and rapid progress of a player who had not won a singles match on the ATP World Tour as recently as this time last year, before assessing Tsitsipas' chances of making an impression at Flushing Meadows. Tsitsipas' success at a young age owes much to his mother and father's connection to tennis. In an 'ATP Uncovered' video produced in 2017, the youngster said: "My mum used to be a professional tennis player, my dad is a tennis coach - he studied tennis at university. "They were working as tennis coaches in the resort next to our house. I was hanging around all day, it's how I started actually, I hit my first tennis balls in this club. They introduced me to tennis, basically." Tsitsipas' father, Apostolos, still coaches him to this day, while the youngster has also benefited from training at the highly regarded Mouratoglou Academy in France. An imposing figure at 6ft4in, Tsitsipas is also a dynamic and agile presence on court. However, his biggest strength at this stage is undoubtedly his forehand. Countless players are capable of powerful shot-making on the forehand wing, but few can match the versatility of Tsitsipas, whose wide range of strokes must already be the envy of many. 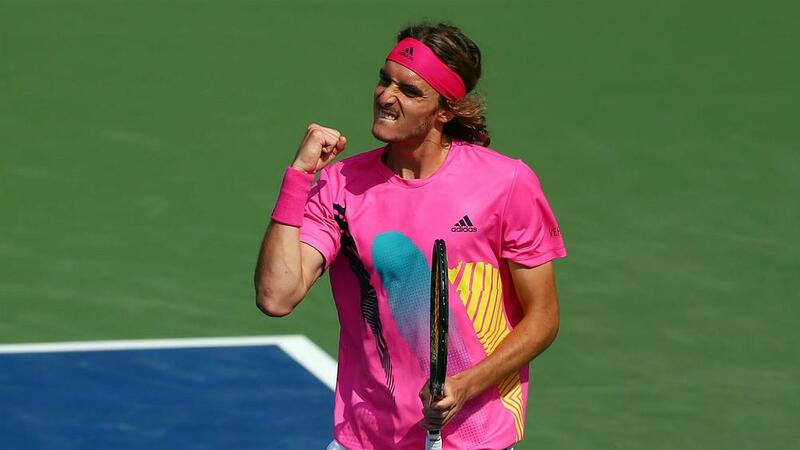 In the space of four months, Tsitsipas has surged up the world rankings, from 71st in mid-April to his current position of 15th. His initial breakthrough came at the Barcelona Open - an ATP 500 event - where he recorded notable wins over Diego Schwartzman, Dominic Thiem and Pablo Carreno Busta on his way to a maiden tour final. Tsitsipas was trounced by the 'King of Clay', Rafael Nadal, in the final, but it was not long before he provided even more compelling evidence of his rare talent. At the Rogers Cup in Toronto earlier this month, he followed up an opening-round victory over Damir Dzumhur by beating four top-10 opponents in succession - Thiem, Novak Djokovic, Alexander Zverev and Kevin Anderson. Another final loss to Nadal followed, yet Tsitsipas forced a tie-break in the second set on this occasion and could be hugely proud of a stunning week. Despite only recording his first tour-level win last October, Tsitsipas is now the youngest member of the world's top 20, that run to the Rogers Cup final having elevated him to 15th in the rankings a day after he celebrated his 20th birthday. The great Roger Federer was 14th in the world at the same point in his career and made it to world number one for the first time two and a half years later. Reaching the peak of the rankings as quickly as Federer appears a tough ask for Tsitsipas, particularly with Nadal and Djokovic still in their early thirties and seemingly capable of adding significantly to their combined haul of 30 grand slam titles. However, world number four Zverev - who was ranked 20th when he turned 20 last April - and the 24-year-old Thiem are the only under-25s above Tsitsipas in the rankings, with six of the current top seven aged between 29 and 37. In years to come, Tsitsipas could well be the man to beat. Despite being seeded 15th at Flushing Meadows, Tsitsipas will need to overcome a couple of notable opponents if he is to reach the last eight of a grand slam for the first time. He will face a qualifier in round one and an unseeded Russian, either Daniil Medvedev or Evgeny Donskoy, if he reaches round two. However, 20th seed Borna Coric, another of the tour's leading youngsters, is a potential third-round opponent and Tsitsipas could meet world number three Juan Martin Del Potro or former US Open champion Andy Murray in the last 16.